Do you enjoy drinking your vegetables? And no, I am not referring to green smoothies. 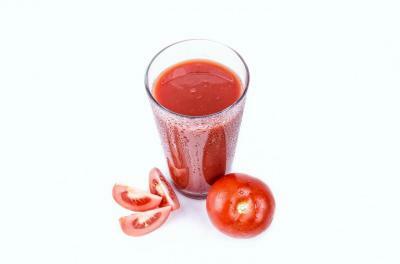 Today's post is on tomato juice. Let's save green smoothies and vegetable juice – a blend of veggies – for another day. An 8-oz cup of tomato juice has around 40 calories, 9g carbohydrates, 1g fiber, 2g protein, and a variety of vitamins and minerals, including vitamins A and C and potassium. Tomato juice is not a significant source of fat. A raw tomato contains some sodium. So even unsalted tomato juice has some sodium, around 25mg sodium per 8-oz cup. An 8-oz cup of commercially-made tomato juice with salt as an ingredient has around 600mg sodium. Sodium does not add calories to a food, so the calories in the juice will be the same. Buy: Choose reduced-sodium or low-sodium tomato juice to limit added sodium in the diet. Tomato juice is usually available in a shelf-stable bottle. Look for bottles with a "use by" date as far out as possible. "Use by" dates are a measure of quality. If the store has a sale on tomato juice bottles close to the "use by" date, still consider buying it. Once the "use by" date passes, the juice may not taste as fresh as before the date, but should still be safe to drink as long as the bottle is otherwise sealed and was not damaged or held unsafely. Price: Tomato juice prices will vary by brand, size of bottle, and any additional ingredients, such as in spicy or hot styles of tomato juice. Choose a brand that fits your budget and personal tastes. Store: Store unopened bottles of tomato juice at room temperature in a dark, cool place. Unopened bottles can also be stored in the refrigerator. Once opened, store the bottle in the refrigerator and use within 1 week. The brand of tomato juice may have a recommended shelf-life date on the package you can follow. To freeze tomato juice, pour juice into plastic freezer containers and leave a half inch to a full inch of headspace; juice will expand as it freezes. Use within a few days of being defrosted. Prepare: Commercial tomato juice can be used from the bottle without other preparation. To make your own tomato juice, the National Center for Home Food Preservation has instructions: Canning Tomato Juice and Freezing Tomato Juice. Eat: From drinking a glass to cooking with tomato juice, enjoy a versatile food! Consider cutting up the veggies, draining the beans, and browning the meat the night before to speed up assembly in the morning. Store them in separate containers in the refrigerator. 1. In a skillet over medium heat, cook turkey until browned, breaking into small pieces. Drain fat from meat. 2. Add cooked turkey and remaining ingredients to a 3-quart or 4-quart slow cooker. Stir to combine. If chili looks dry, add more water just until mixture is covered. 3. Cover slow cooker with lid. Cook on LOW for 8-12 hours or on HIGH for 4-5 hours.